Keep up with the most important advances in the science of Obstetrics and Gynecology. The American Journal of Obstetrics and Gynecology covers the full spectrum of the specialty, American Journal of Obstetrics & Gynecology. 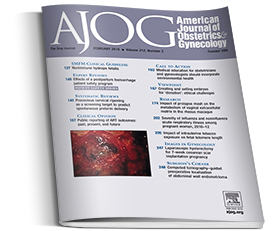 The American Journal of Obstetrics and Gynecology or the “The Gray Journal,” presents the latest diagnostic procedures, leading-edge research, and expert commentary in maternal-fetal medicine, reproductive endocrinology and infertility, gynecologic oncology, and urogynecology as well as general obstetrics and gynecology. An important focus of the journal is the diagnosis, treatment, prediction and prevention of obstetrical and gynecological disorders. The Journal also publishes work on the biology of reproduction, and content which provides insight into the physiology and mechanisms of obstetrical and gynecological diseases. In addition to these topics The American Journal of Obstetrics and Gynecology publishes the annual meeting papers of several of its sponsoring societies, these include the Society for Maternal-Fetal Medicine and the Society of Gynecologic Surgeons. Original Research Articles and Clinical Opinions are published in two forms: an abbreviated article in the print journal and the full length version of that article online in the Web version of the American Journal.